Metastatic pulmonary calcification (MPC) may develop in patients with secondary hyperparathyroidism, related to end-stage renal disease (ESRD).1 The histologic pulmonary findings show calcium deposition in the lung interstitium, alveolar septa and bronchial walls.2 We present a patient with CT findings of MPC that resolved with medical treatment for secondary hyperparathyroidism. To our knowledge, complete resolution of metastatic pulmonary calcification following treatment has not been previously described in the literature. A 39-year-old male presented with chest radiographic findings of bilateral upper lobe nodular opacities compatible with calcification (Figures 1). The patient was on hemodialysis treatment for the past five years for chronic renal failure due to biopsy proven focal sclerosing glomerulonephritis and longstanding hypertension. Additional illnesses included hypothyroidism and anemia. The patient had no respiratory complaints. Physical examination of the lungs was normal. Chest CT scans showed scattered high attenuation focal nodular and broad linear opacities in the upper lobes measuring up to 210 HU (Figure 2A, 2B). Both lower lobes were spared. 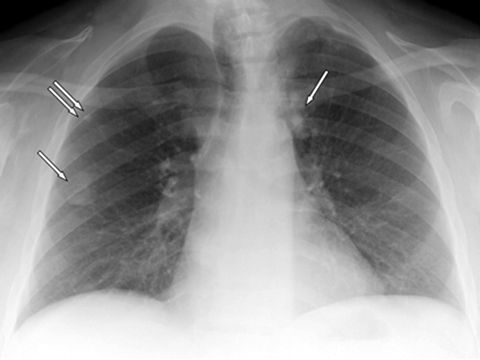 The findings were consistent with metastatic pulmonary calcification. Laboratory results showed mild hypercalcemia, serum calcium levels up to 12.2 (normal, <10.6 mg/dL) and hyperparathyroidism, parathyroid hormone levels up to 3189 (normal, <65 pg/ml). Phosphate levels were not performed. Treatment with Sevelamer carbonate and lanthanum carbonate was initiated for hyperparathyroidism. During the treatment for hyperparathyroidism the serum calcium, phosphate and parathyroid hormone levels varied from normal to elevated. Serum calcium levels varied from 5.7-11.8 (8.4-10.6 mg/dL), serum phosphate levels varied from 3.2-7.3 (2.5-4.9 mg/dL) and parathyroid hormone levels varied from 35.5-3116 (10-65 pg/ml). A follow-up chest CT scan performed 18 months later revealed near complete resolution of the calcified focal air space consolidation in both upper lobes. A minimal scar remained in the left upper lobe while all other lesions resolved without scarring (Figure 3A, 3B). Because the secondary hyperparathyroidism remained out of control, a subtotal parathyroidectomy was performed approximately one year after complete resolution of the metastatic pulmonary calcification. Post-operative parathyroid hormone levels gradually decreased to normal, 14 pg/ml. Laboratory results showed serum calcium, phosphorus and parathyroid levels were elevated prior to medical treatment. After initiation of medical treatment serum levels fluctuated from normal to elevated, but the levels were trending toward normal. The trending to normal values with medical treatment may have been sufficient to promote dissolution of the pulmonary calcifications. Parathyroidectomy was performed for better control of the secondary hyperparathyroidism but the surgery was performed after the metastatic pulmonary calcifications had resolved. Imaging in patients susceptible to this condition may inadvertently suggest the diagnosis. Chest radiographs can demonstrate the development of pulmonary opacities but are not effective for calcium detection.3 However, the chest radiograph may provide a clue for further investigation with chest CT. Chest CT and Tc-99m bone imaging have been reported to be most useful for diagnosis.15 Chest CT can be used to characterize the pattern and location of calcium deposition. The upper lobe predominance as demonstrated in our case can be explained by the alkaline environment in the upper lobes that promotes the precipitation of calcium salts.3 Upper-lobe alkalinity can be explained by an increased upper lobe ventilation perfusion ratio (3:1) compared to the lower lung V/Q ratio (0.6:1). A limitation of our report is the lack of pathological proof to support our diagnosis. Our radiologic diagnosis was based on the patient’s clinical presentation and diagnostic imaging features. Metastatic pulmonary calcification in ESRD patients with secondary hyperparathyroidism can resolve completely with medical treatment as demonstrated n our patient. Cadavid JC, DiVietro ML, Torres EA, et al. Warfarin-induced pulmonary metastatic calcification and calciphylaxis in a patient with end-stage renal disease. Chest. 2011;139(6):1503-1506. Lingam RK, The J, Sharma A, et al. Metastatic pulmonary calcification in renal failure: A new HRCT pattern. Br J Radiol. 2002;75:74-77. Marchiori E, Muller NL, Souza Jr AS, et al. 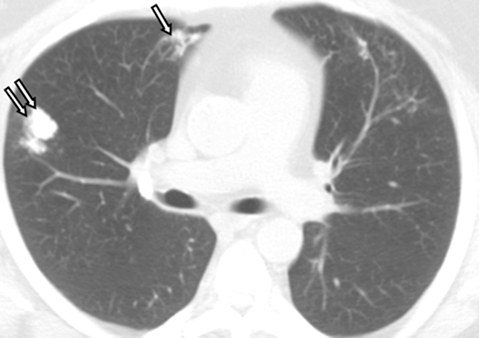 Unusual manifestations of metastatic pulmonary calcification high-resolution CT and pathological findings. J Thorac Imaging. 2005;20(2):66-70. Hochhegger B, Marchiori E, Souza Jr AS. 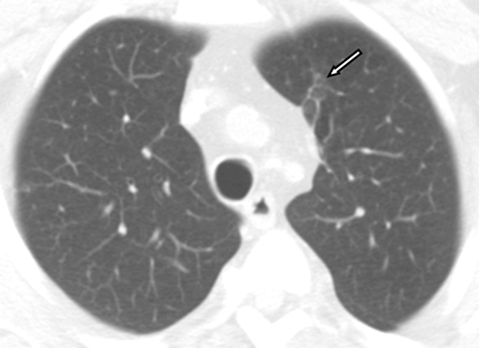 MRI and CT findings of metastatic pulmonary calcification. Br J Radiol. 2012;85:e69-e72. Thurley PD, Duerden R, Roe S, et al. 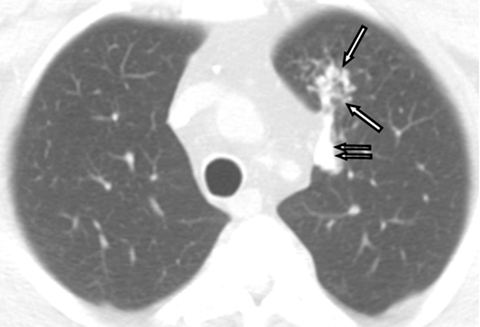 Rapidly progressive metastatic pulmonary calcification: Evolution of changes on CT. Br J Radiol. 2009;82:155-159. Kuroda N, Tada H, Takahashi J, et al. Myofibroblasts in the stroma of metastatic pulmonary calcification in a patient with chronic renal failure. Med Mol Morphol. 2006;39(3):161-163. Bendayan D, Barziv Y, Kramer MR. Pulmonary calcifications: A review. Respir Med. 2000;94(3)190-193. Chan ED, Morales DV, Welsh CH, et al. Calcium deposition with or without bone formation in the lung. Am J Respir Crit Care Med. 2002; 165(12):1654-1669. Kang EH, Kim ES, Kim CH, et al. 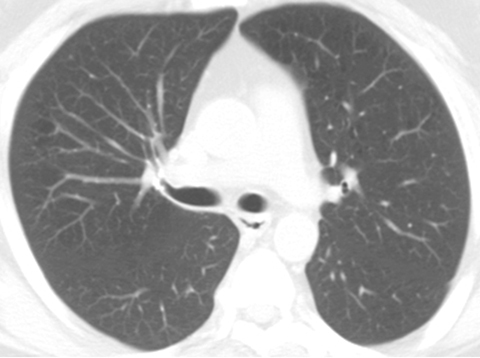 Atypical radiological manifestation of pulmonary metastatic calcification. Korean J Radiol. 2008;9:186-189. Bestetti-Bosisio M, Cotelli F, Schiaffino E, et al. Lung calcification in long-term dialysed patients: A light and electronmicroscopic study. Histopathology. 1984;8(1):69-79. Murris-Espin M, Lacassagne L, Didier A, et al. Metastatic pulmonary calcification after renal transplantation. Eur Respir J . 1997;10(8): 1925-1927. Ullmer E, Borer H, Sandoz P, et al. Diffuse pulmonary nodular infiltrates in a renal transplant recipient. Chest. 2001;120(4):1394-1298. Yasuo M, Tanabe T, Komatsu Y, et al. Progressive pulmonary calcification after successful renal transplantation. J Intern Med. 2007;161-164. Coolens JL, Devos P, De Roo M. Diffuse pulmonary uptake of 99mTc bone-imaging agents: Case report and survey. Eur J Nucl Med. 1985;11(1):36-42. Hartman TE, Müller NL, Primack SL, et al. Metastatic pulmonary calcification in patients with hypercalcemia: Findings on chest radiographs and CT scans. Am J Roentgenol. 1994;162(4):799-802. Kuhlman JE, Ren H, Hutchins GM, et al. Fulminant pulmonary calcification complicating renal transplantation: CT demonstration. Radiology. 1989;173(2):459-60. Timmins S, Hibbert M. Metastatic pulmonary calcification. N Eng J Med. 2010; 363;26:2547. Marchiori E, Souza AS Jr, Franquet T, et al. Diffuse high-attenuation pulmonary abnormalities: a pattern-oriented diagnostic approach on high-resolution CT. Am J Roentgenol. 2005;184(1):273-282. Ziessman HA, O’Malley JP, Thrall JH. Pulmonary system. In: Ziessman HA, O’Malley, Thrall JH eds. Nuclear Medicine: The Requisites in Radiology. Philadelphia: Elsevier Mosby, 2006: 508-539. Peungjesada S, Baskin MH, Winer-Muram HT. Metastatic pulmonary calcification. Appl Radiol. 2016;45(1):31-33. Prepared by Dr. Peungjesada, Dr. Baskin, and Dr. Winer-Muram while at Indiana University School of Medicine, Indianapolis, IN.